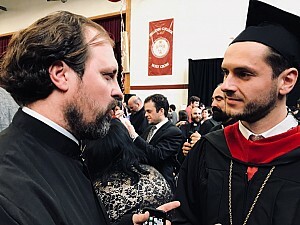 Hellenic College Holy Cross Greek Orthodox School of Theology conducted its 76th Commencement exercises on Saturday, May 19, 2018. Some 600 people filled the Pappas Gymnasium to witness the impressive ceremony. In addition to His Eminence Archbishop Demetrios, Geron of America, these included His Eminence Metropolitan Methodios of Boston, His Eminence Metropolitan Gerasimos of San Francisco, His Eminence Metropolitan Savas of Pittsburgh, His Grace Bishop Andonios of Phasiane, all alumni of Holy Cross, and numerous members of HCHC's Board of Trustees. Archbishop Demetrios offered the invocation, after which the Holy Cross St. Romanos the Melodist Byzantine Choir led the singing of both the Greek and American national anthems. Rev. Fr. Christopher Metropulos, HCHC President, then delivered the salutation. Greetings and congratulations were offered by Stratos Efthymiou, Consul General of Greece in Boston, and Jeanie Ranglas, First Vice President of the National Greek Orthodox Ladies Philoptochos Society, who assured the graduates that the 25,000-member organization "will always be with you on your journey." Before offering the closing benediction, His Eminence Archbishop Demetrios exhorted the new graduates to be courageous in spreading the Light of Christ and to remember that they will never be alone "because He is with you." He conveyed to them the blessing and love of His All Holiness Ecumenical Patriarch Bartholomew, and promised to share with him the "vigor, hope, and dynamism" manifested by all at Hellenic College Holy Cross, which is a four-year college, School of Theology, and seminary under the aegis of the Ecumenical Patriarchate of Constantinople. 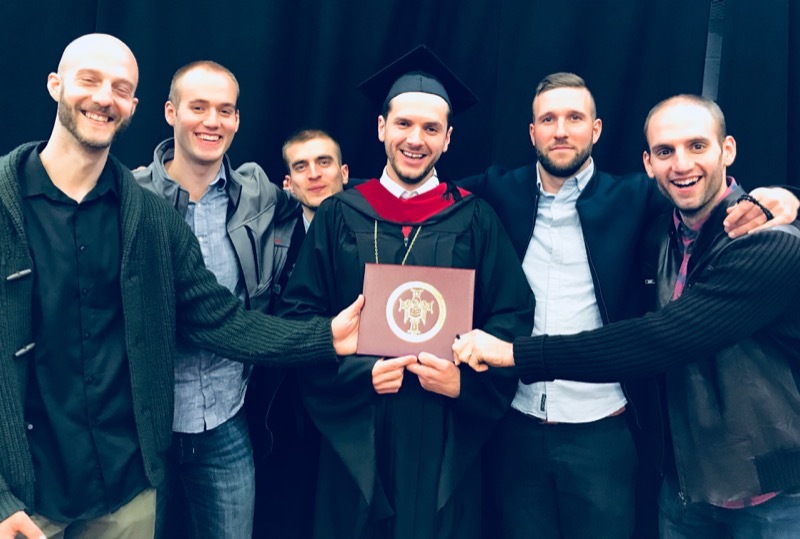 Graduate Srdjan Maksimovic, a student of the Serbian Orthodox Church, recounted his experience at HCHC by noting: “Studying at Holy Cross Greek Orthodox School of Theology and Harvard Divinity School (also a member of the Boston Theological Institute) was a great privilege and honor. Holy Cross is a vibrant community with daily chapel services, great library resources, highly esteemed professors, and the opportunity afforded to take classes at some of the best universities in the world through the Boston Theological Institute makes the experience of attending Holy Cross amongst the best possible. For me the pivotal point of the Masters of Theology two-year program was the completion of my thesis research, which is a150-page Thesis titled ‘The Incident at Antioch in Galatians 2: A Multifaceted Biblical Narrative’, defended under Dr. Brad Braxton (Harvard University), Dr. Bruce Beck (HCHC) and Fr. George Dragas (HCHC). The completion of my thesis, which will be published soon marked the completion of my Th.M., which I completed with the highest distinction (4.0 GPA). The next step is my pursuit of doctoral studies at Fordham University (Graduate School of Arts, Sciences, and Social Justice) in the upcoming fall semester. The overall experience at the ‘holy hill’ in Boston could be comprehended through two, HCHC contemporary community famous sayings: ‘it is all about students’ and the second one ‘it is all about information, formation, and transformation.’"